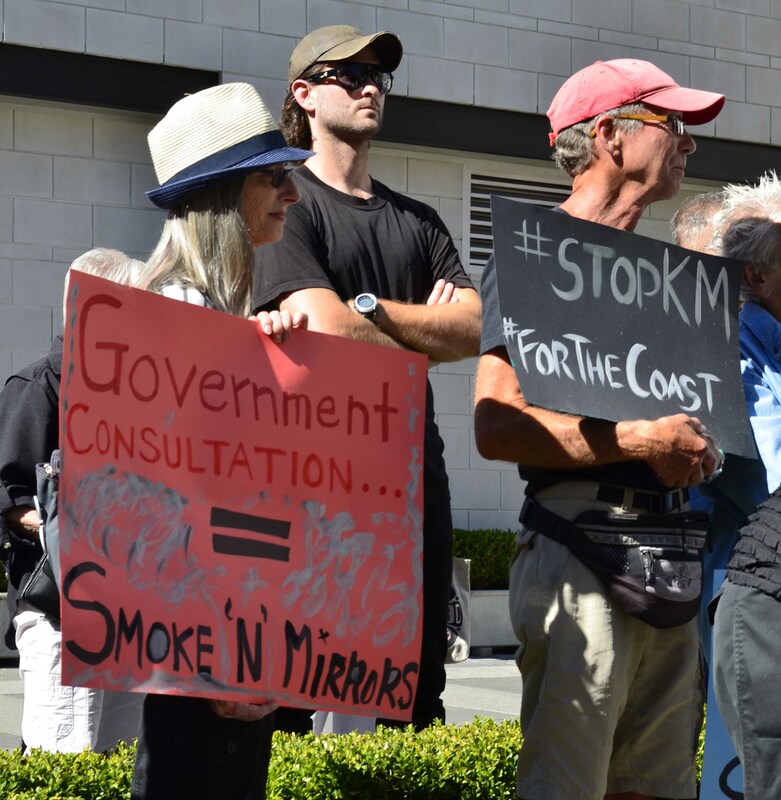 Do you remember those hastily-arranged, poorly-organized meetings that the federal government set up in the dog days of August to get input on the Kinder Morgan pipeline and tankers proposal? You know, the meetings in which an ad hoc ministerial panel was charged with the task of compensating for the enormous shortcomings of the National Energy Board’s process, conducted under the Harper government? The meetings at which 91.4 per cent of speakers opposed Kinder Morgan? Well, the panel released its report this week, and it raises a series of crucial questions for the federal cabinet. Simply put, these questions make approval impossible. The panel asked that Cabinet consider how building this pipeline can be reconciled with Canada’s climate change commitments. Spoiler alert: it can’t—you can’t build pipelines and be a climate leader. End of story. Rally at the summer meeting in Victoria. Photo by Kat Zimmer. The panel also asked how cabinet could square approval with a federal commitment to reconciliation with First Nations. Again, you can’t, given the numerous First Nations who adamantly oppose this project. The panel asked how the federal cabinet can be confident of its decision given the flaws in the NEB process and public criticism of the ministerial panel’s own review. Good question. The reality is that the report from the Ministerial Panel does not provide the basis for Cabinet approval of Kinder Morgan. We can only imagine how Prime Minister Trudeau, Natural Resources Minister Jim Carr, and Environment & Climate Change Minister Catherine McKenna are scrambling to figure out how to spin this. In fact, approving this project would be abandoning Canada’s commitment to real climate action, would impose a death sentence on the southern resident orca population and would invite ecological and economic disaster in the form of an inevitable tanker spill. The Ministerial Panel report makes clear that there is no way to approve this pipeline without undermining commitments on climate and indigenous rights. If cabinet takes the report’s questions seriously and bases its decision on the best available science, there is no way this pipeline will be built. And yet rationality has been lacking lately. It’s distinctly possible that the federal government will announce approval in the next few weeks, just as it approved the Petronas fracked gas plant and the Site C megadam (which will power the fracking fields in the Peace), and just as it adopted the grossly inadequate emissions targets of the Harper government. But stay tuned, because along with the 91.4% of people who voiced their opposition to the panel, we aren’t going anywhere. This is our home, and the fight is far from over. Please donate today to help us keep up the fight. Feature image by Gerry Gaydos. Victoria, B.C.—Sierra Club BC released the following statement from campaigns director Caitlyn Vernon. “The report by the ministerial panel, released today by Natural Resources Canada, highlights the failures of the NEB process and raises a series of crucial questions for cabinet’s consideration. “These questions make approval impossible. 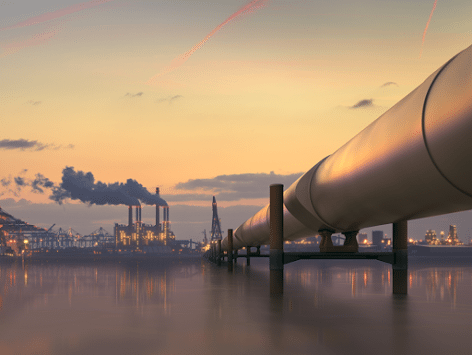 “In answer to the panel’s question about climate change, the science is clear: building this pipeline would make it impossible to meet Canada’s climate commitments. You can’t build pipelines and be a climate leader. “Regarding the panel’s question about how cabinet could square approval with a federal commitment to reconciliation with First Nations, the answer can be found in the numerous First Nations who firmly oppose this project. “The panel also raises the question of how cabinet can be confident in an assessment based in a process full of flaws, both the NEB process and the ministerial panel meetings themselves. “The panel asks—given recent spills and the inadequacy of spill response—whether this pipeline and tankers project is worth the risk. “They also note the evidence presented to the NEB that the project would have significant impact on southern resident killer whales that are protected under the federal Species at Risk Act. “This panel was no remedy for a flawed NEB process, and this report does not provide the basis for a federal cabinet approval. “Approving this project would be abandoning our commitment to real climate action, imposing a death sentence on the southern resident orca population and inviting ecological and economic disaster in the form of an inevitable tanker spill. See attached backgrounder for a summary of flaws in the ministerial panel processes. Panel had no mandate to make recommendations based on their findings, and therefore no clarity for participants on how the government would use the information it compiled, how it would be compiled, or how it might impact Cabinet decision-making. Some local First Nations leaders and municipal officials only heard about the meetings through Facebook and other unofficial channels, while others were informed on short notice. Meetings of “experts” were scheduled, but no outreach was made to experts who had concerns about the project. They were left to self-identify. Panel Chair Kim Baird had a past business relationship with the proponent, was a registered LNG lobbyist, and penned a pro-pipeline op-ed in a national newspaper while the panel process was underway. Approximately 55,000 people submitted comments and letters, but 2 days before the comment deadline, the Panel sent letters to numerous individuals and citizens’ groups that said they would not consider repetitive letters initiated by third parties. The B.C. Civil Liberties Association found this “dismissal is an unreasonable interference in expression of freedom of individuals and their participation in a public consultation process.” After the BCCLA letter, the NEB reversed its decision, but the experience left participants with a continued sense of government bias against citizens opposed to the proposal. Meetings were announced on short notice in the middle of summer. The online process to register was cumbersome and a deterrent to participation. Locations in many communities were difficult to access and no provisions were made to make access easier. Due to time and room capacity limitations, hundreds of attendees were not able to participate. No translation was available for French-speaking participants until the last 2 days of meetings. No official records (no stenographer or audio-video recordings) were taken and the Panel’s mandate was broad and poorly defined, amplifying concerns of process bias. When the Canadian government decided to throw together last-minute public meetings on the proposed Kinder Morgan pipeline during the height of summer, they seemed to hope the meetings would float serenely under the radar. Packed Victoria town hall on August 23. Photo by Kat Zimmer. The meetings were poorly promoted and the timelines were inadequate to allow people to properly prepare presentations. The locations weren’t clear and the meeting structure and online process to register were unwieldly and off-putting. Several meeting dates changed and more dates were added due to an outcry about some communities being excluded. The meetings had an ad hoc feel and it wasn’t clear to anyone how the government would use the information it compiled, or even how it would be compiled. Local First Nations told us they heard about the meetings only because organizations such as Sierra Club B.C. alerted them. Despite all this, it was genuinely inspiring and heartening to see a passionate determination on the part of ordinary citizens to have their voices heard and to stand up for this coast. About 400 people showed up to the Victoria public meeting, many driving several hours to be there. Yet more than 100 people were shut out of the room, denied their chance to be heard. 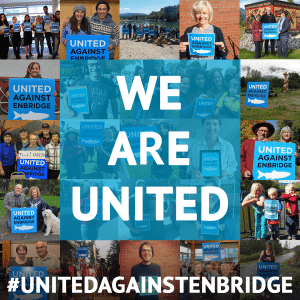 In all the meetings, 418 people were opposed, with only 39 speaking in favour – a decisive 91.4 per cent against Kinder Morgan’s proposal. In addition, 17 First Nations were opposed, as were 21 local governments. 100+ people shut out of the Victoria town hall. Photo by Kat Zimmer. The federal government had billed these meetings as an effort to compensate for the multiple shortcomings of the original National Energy Board hearings. The NEB recommended approval of the pipeline and tankers proposal despite widespread opposition. Sources close to Prime Minister Justin Trudeau say he is determined to approve a pipeline – and Kinder Morgan’s Trans Mountain is the likeliest candidate. We can’t let the federal government use this latest panel to provide an air of legitimacy to the NEB’s deeply flawed process. Prime Minister Trudeau has said that “governments grant permits, communities grant permission”. With each of the meetings along the pipeline and tanker route, it became more and more clear that permission has not been granted. British Columbians prefer a commitment to real Sunny Ways, without the fossil fuel haze and economic malaise of the Kinder Morgan pipeline. The public meetings provide the Prime Minister with an excellent opportunity to make a change in policy direction. His government now has community backing to drop its support for Kinder Morgan and bring Canada’s economic policy into alignment with his commitments on climate. Their mandate to move boldly and decisively on climate and the economy has been confirmed. The climate math is strikingly simple: It is not possible to be a climate leader and build tar sands pipelines. Saying no to Kinder Morgan would be to say yes to our Paris climate commitments, to protection of BC’s environment and economy from the threat of catastrophic pipeline and tanker spills and to repositioning BC and Canada as job-growth leaders in the emerging renewable energy economy. At 4:40, our climate & energy campaigner Larissa Stendie takes on the impossibility of spill response and the panel’s bias. At 19:00, our campaigns director Caitlyn Vernon talks about the climate change implications of the pipeline. Featured image (Top): Victoria Mayor Lisa Helps spoke at a large, peaceful action outside the Victoria townhall organized by Sierra Club BC, Wilderness Committee, and Greenpeace. Photo by Kat Zimmer.